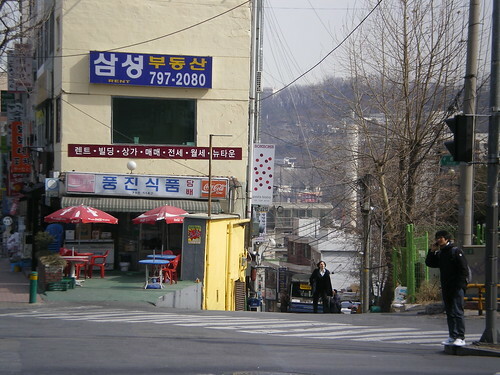 Opposite Kabinnet, across from the Cheil building on the main Itaewon road is a tiny little restaurant that deserves your attention. 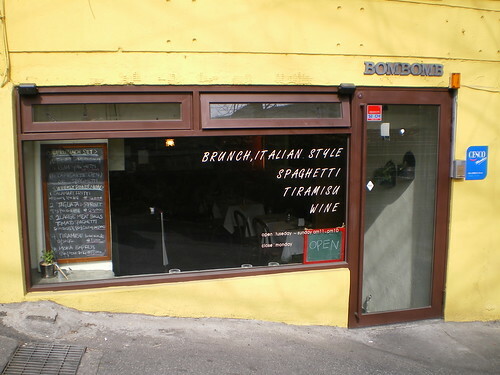 Bombomb seats about twenty people, has a staff of one (chef/owner/waitress) and is the cutest and cheapest Italian restaurant in Itaewon. The lunch menu consists of two dishes and that's it! 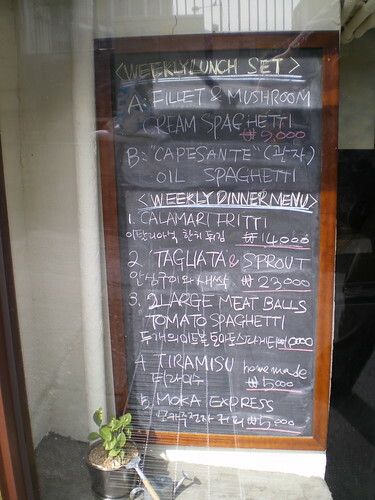 You can either have the cream spaghetti with chopped steak and mushrooms or the oil spaghetti with clams, they both come in at 9,000 won and offer one of the cheapest lunch sets in the area. For your money you get access to the small salad bar and the tasty bread, plus your chosen dish. 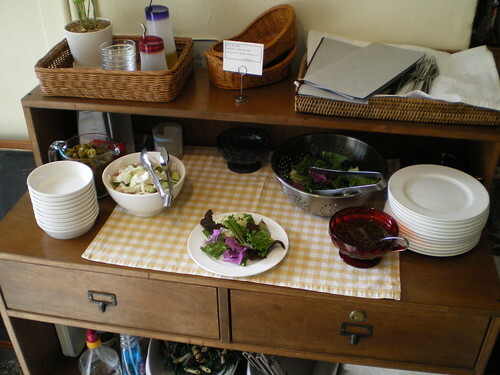 The salad bar is simple, but the greens are fresh and the bread seems to be home-baked. I ordered the cream spaghetti and was not disappointed. 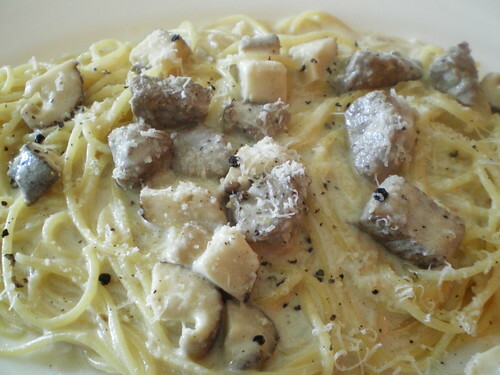 Bite-size pieces of fillet steak mixed with juicy chunks of mushrooms, with enough sauce to cover the ample portion of spaghetti, but not too much as too drown the dish. Topped off with a generous helping of freshly cracked black pepper and grated parmesan cheese. The spaghetti was perfectly cooked and the beef was very tender. 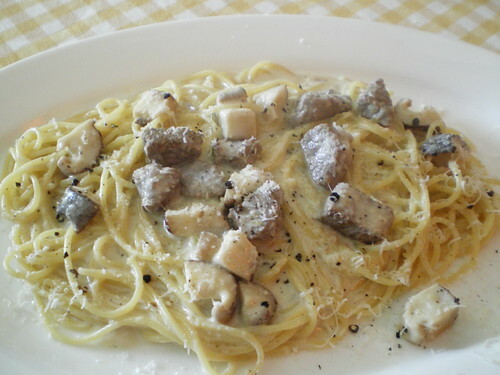 The sauce was quite salty, but the mixture of cream, beef and mushrooms worked well together, forming a very satisfying lunch. A far superior spaghetti to most Korean Italian restaurants. 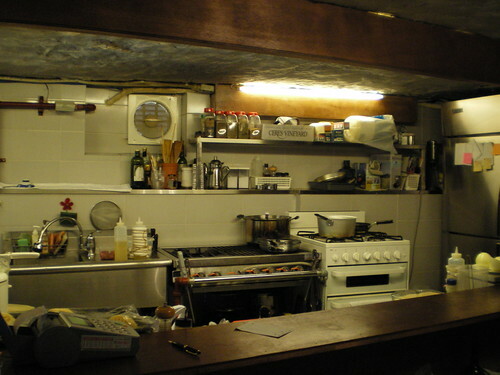 This tiny kitchen produces wonderful food and the dinner menu's meatballs are well worth a try. Bombomb's menu is very small and in Korea that can be the sign of a good restaurant (Disclaimer: small menus don't always mean wonderful food...). The owner is not stretching her skills too thin and is giving us the best that her kitchen can offer. 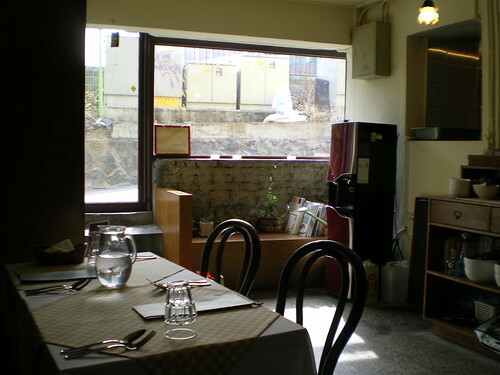 I've eaten here a few times and have not been disappointed and during Korea's economic recession it is very pleasing to be able to find a great Italian lunch for under 10,000 won. If you fancy sampling Bombomb's menu then take the Cold Stone Creamery exit out of Itaewon station and head down past Starbucks, Sortino's and Ola Mario until you get to the humungous Cheil building. Then right in front of you, past the zebra crossing, is the warm welcoming yellow of Bombomb. Take a chance, try your luck in this tiny little restaurant and you won't be disappointed. Call Bombomb on 02 794 8770.